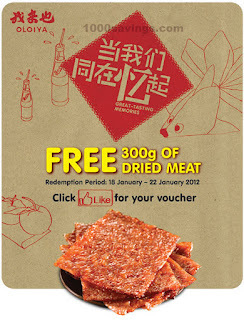 FREE 300g of OLOIYA 我来也 dried meat voucher! How to get the FREE 300g OLOIYA 我来也 dried meat voucher? Visit and LIKE OLOIYA 我来也 facebook page. Fill up your information and click "Get my FREE Voucher"
Print out your voucher and personally redeem at the OLOIYA 我来也 outlet of your choice. Share this with your friends yeah!